Simpler, faster, safer... and paperless. No more parent-teacher communication books. 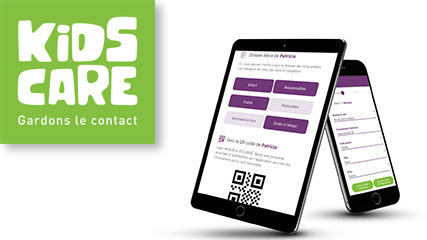 Kidscare is a fully secure application for web and mobiles whose main purpose is to create a (digital) link between parents and the school. The objective: no more paper! Kidscare can be used to fill out and update the information sheet required at the start of the school year. The application helps manage absences, late arrivals, appointment bookings, and in doing so replaces traditional communication books. Finally, Kidscare can be used to manage permissions for dismissal and extra-curricular schedules. This tool directly brings together parents, the school, and the municipality in an intrapreneurial approach that significantly simplifies administrative tasks. In late 2017, Sandra, Isabelle and Corinne, three mothers and employees at Docapost, a subsidiary of Le Groupe La Poste, won the “20 Projects for 2020” contest held by Le Groupe La Poste to support employee projects that fit into its growth strategy. In February 2018, the Kidscare intrapreneurial adventure began. In September 2018, an initial version was launched in 35 classes in the Alpes Maritimes region. Kidscare is the only solution to address all school stakeholders (academic, extra-curricular and parents) and to fully integrate the following three features: digitisation of student files, digital communication, and management of dismissals. Student file management enables parents to fill out and update information about their child/children online, directly, without going through paper forms, and therefore without administrative re-typing errors. The communication module enables parents to talk to the school (teachers and administrators), with the option of sending notifications and receiving confirmation of receipt. Dismissal management lets them alert the school at any time (for a planned dismissal, permission for a designated person to pick up the child, etc.). Eliminating paper communications between parents and the school generates economic savings of €4 per student per year, and also saves considerable time for teachers and administrative staff. Sharing information between parents and the school via Kidscare means safe care of children. “This is a really useful application that replaces the communication books used in schools. Information must be validated in order for it to apply. This avoids mistakes when a child needs to be dismissed from school for a particular reason. The application replaces paper and helps protect the environment, which is a real plus at a time where we're teaching children about this. It sets a good example for them”. “We’ll definitely save a lot of time communicating with parents. No more photocopies, cutting, gluing or checking that messages have been read! Parents who have read the information can check it off quickly. A third party can be added to pick up the children, which is very practical”. “Once again, Kidscare proved its effectiveness this morning. There was an alert in the morning about a gas leak in the neighbourhood. My son’s school relayed the evacuation information via the Kidscare application. The parents reacted very quickly”. “It's great how the Kidscare application saves time when you want to communicate with parents. It's a lot faster than photo-copying a note, cutting it out, taking out the communication book, and then asking the children to glue the message in. Also, it’s no longer necessary to check the books the following morning to make sure that the information was read. Plus, it saves paper. It’s also very practical and quick to check if a child enrolled in day care needs to leave at 4:30 for a particular reason”.